What is Food Like in China? Oh my. First, let me start with this, I love American Chinese Food. I call it American because after being in China, we are a paltry shadow of the deliciousness that is the balanced spiced meals of China. I loved eating there. The food was GOOD. I’ve tried to explain the difference with our Chinese food. The best I can say is that where we typically have three dominant flavors: salt, garlic, soy sauce (in general), I would have foods that had 4 or 5 spices perfectly balanced, making my tongue sing with joy. Oh, and the food can be spicy. Not all food is spicy, but they like spicy there. One day we went to a Thai restaurant and they didn’t come over and say, what number of spice do you like 1-5? It was just Thai spicy. Only a couple of dishes were like that (and we ordered like 13 different things) but those that were, burned. For anyone who knows me, I can eat spicy with the best of them, and I was getting a little worried. It all was delicious however and thankfully I had started with the hottest dishes as the others were not the kind to flay your tongue alive. The Chinese food was never “Thai” hot, but it had a good burn on occasion. It would be considered hot to many people I know. It was never oppressive however, it was always harmonious to the other flavors. I can’t stress enough how balanced much of the food was. One day, we stopped for lunch at a fish restaurant on the 17th floor of a shopping mall (see Street and other Signs, Bathrooms, Elevators blog about finding the damn lift!). It was a fun place, setup with small booths that could hold 4 people. Each table had a wire that came out from the wall. They didn’t speak English but as like most places, the menu had pictures. 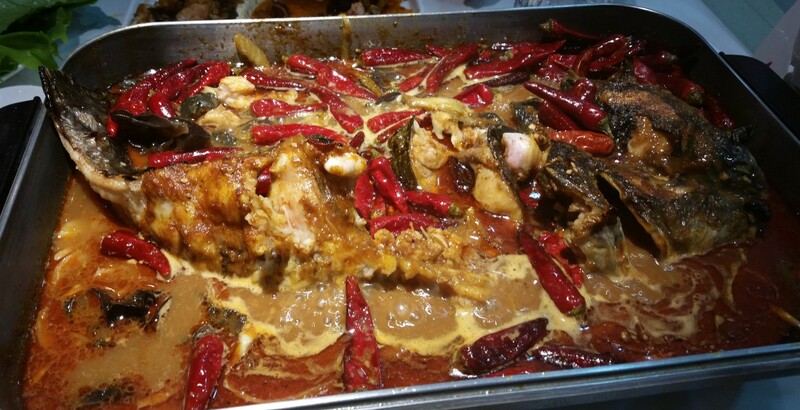 We were able to work out a request for a whole cooked fish with what looked like an entire fields worth of hot chili peppers on it (Thankfully, my travel/work partner was as into spice as me!) and they waved us over to the back of the restaurant. We weren’t sure what was going on until the cook pulls a huge catfish looking thing out of a tank where it had been swimming and they had us pick which one we wanted. I will tell you this, If I had the money, I would open this exact same restaurant in Portland and eat there every day until I die, so good. Okay, back to the story, we pick our now doomed fish and walked back to our table. We ordered some fresh vegetable sides and some rice and some water. Now, there is a thing about water in China. I don’t know if its because they don’t drink tap water unless its been boiled but, if we asked for water to drink, they always brought us hot water. It was pretty funny. Maybe it was because they always drink tea instead and prefer something warm to drink with their food, I don’t know. It was different, but I actually started to like drinking hot water with my food. I’ve kept it up since I returned and find that it hits the spot when I crave tea but it’s too late to drink caffeine (I know, fricking older I get, grrrr). Okay, so our fish is done and out it comes in a rectangle cooking platter that sits on a small stand. The platter is about 3 inches deep, maybe a foot wide and two feet long. There is the fish, split down the middle, cleaned and cooked whole in a deliciously spicy and tangy (not American sugar tangy, but well, tangy) sauce. They brought out our fresh vegetables and what you do is drop them into the cooking platter. Oh, I forgot, they bring it out and then plug it into the wire at the table so it keeps cooking. This in turn heats the sauce and the vegetables you throw in with the fish. That was one of my favorite meals in China. That fish was sooooooo good and the sauce was like a little peppery nirvana. Not a “oh lord my guts are on fire” peppery, instead it was like, “the tips of my tongue and inner lips are alive with a non-hot spicy joy” type of peppery. We ate every bit of meat off of that thing and cooked our fresh vegetables in the delicious sauce. Oh jeez, my mouth is watering while I’m writing this. Oh, another thing to know about eating in China. They don’t do a big plate for you to mix all your food on. You get a small plate, usually just big enough for the small standing bowl of rice you get. You don’t dump the rice out on the small plate, you use the plate to catch anything that falls off of the rice. Instead, you take whatever other foods you are eating, normally you order a couple of dishes, or in the whole fish case, I took cooked veggies and fish and piled enough for a decent bite on top of the rice. The juices slowly flow into the rice ball and you eat the rice little by little out of the standing mini-bowl as you consume the placed goodies. It’s actually kind of fun and makes much less of a mess dish wise. I’ll try to put some pics in here so you can see what I mean. One other important thing to note: Napkins are not automatically given at a restaurant. I’m not sure why but, many places don’t have them or will charge you for them, or they have smaller tissue like napkins. If you have a beard like me and need to keep it clean, its good to always keep some tissues with you, especially if your nose runs. It wasn’t like nobody had them, it was more like, enough places didn’t that it was an issue. So, TRAVEL TIP: Always keep some tissues on hand when you are out and about! I could detail every meal I had here and it would be a heavenly experience in my mind, I’m salivating at the thought, but I won’t do that for you as I think you get the idea. Eating in China was awesome. It was modern, clean, and delicious. Just be aware that you may get hot water if you ask for drinking water and you may need to bring a napkin. Also, try to eat like the Chinese do, put small pieces of the food ordered on top of the rice while still in the bowl and eat from there, it’s fun and actually keeps the amount of each item fairly well balanced with the rice. I’m trying to figure out how to do the same now that I’m back!